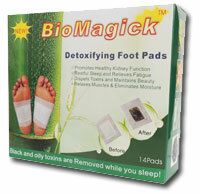 BioMagick Foot Pads help detoxify your body while you sleep. Made from effective, safe bamboo vinegar, vitamin C and herbs, they naturally remove toxins, relax your muscles and help promote healthy kidney function. Wash and dry your feet. Affix the pad (side with printing) against the adhesive, place the pad on the desired area of your foot, peel the top protective paper and secure it to your foot. Apply the pad to the soles of the feet at bedtime for at least 8-10 hours. The pad may become darkened, hard, moist, greasy when removed in the morning. 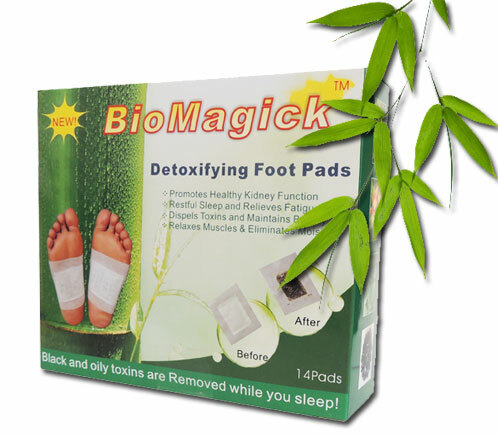 Gently peel off the pads and wipe the toxins from your foot.